House Of Hammerton | Pub Quizzers | Find a pub quiz near you, now. 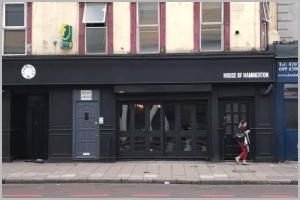 Pub quizzes take place at House Of Hammerton, Islington on Tuesdays (fortnightly) at 19:30. Entry is £2.00, you can have up to 10 people on a team. There are prizes of cash, spot prizes. Happy quizzing! Do you like unique craft beer and quizzes, with some friendly competition? A great bi-weekly quiz at the House of Hammerton in Islington is waiting for you! For only £2 entry, you could win an amazing £50 bar tab for coming in 1st place! If you aren't quite the quizzing genius but love the fun and beer then there's a 6 pack of the newest Hammerton beer for 2nd to last place, as well as some bonus drink questions - so make sure to listen carefully! Get ready and come with your team for your chance to win on Tuesdays! Check the next quiz date by clicking the link. There's no limit on team size but in the interest of fairness, a points deduction system kicks in for teams over 6.